This article is about the Miss Marple film. For the Once Upon a Time episode, see Murder Most Foul (Once Upon a Time). Murder Most Foul is the third of four Miss Marple films made by Metro-Goldwyn-Mayer. Loosely based on the novel Mrs McGinty's Dead by Agatha Christie, it stars Margaret Rutherford as Miss Jane Marple, Bud Tingwell as Inspector Craddock, and Stringer Davis (Rutherford's real-life husband) as Mr Stringer. The story is ostensibly based on the original Christie story, but notably changes the action and characters. Hercule Poirot is replaced by Miss Marple and most other characters are not in the original story. The film was released in 1964 and directed by George Pollock, with David Pursall credited with the adaptation. The music was by Ron Goodwin. The title is a quote from Hamlet (I.v.27-28), where the Ghost comments about his own death, "Murder most foul as in the best it is/But this most foul, strange and unnatural." The third film in the MGM series, this was preceded by Murder, She Said and Murder at the Gallop, and followed by Murder Ahoy!, all with Rutherford starring as Christie's famed amateur sleuth. Margaret McGinty, a barmaid and former actress, is found hanged, and her lodger, Harold Taylor, caught at the scene, seems plainly guilty. Everyone believes it to be an open-and-shut case ... except for Miss Marple. She is the lone holdout in the jury that tries him, leading to a mistrial. Despite the disapproval of Inspector Craddock (Bud Tingwell), Miss Marple decides to delve into the case. She poses as a gatherer for a church 'jumble sale' to enter and search Mrs. McGinty's home. She finds a newspaper with words cut out and several programs for a murder mystery play, Murder She Said, recently performed in the town. These clues lead her to suspect Mrs. McGinty of having blackmailed a member of the repertory company. She auditions for the repertory theatre players, the Cosgood Players, under their actor/manager Driffold Cosgood (Ron Moody). Cosgood is unimpressed by her acting ability, but as she is willing to work for free and mentions she is independently wealthy, takes her on. Miss Marple knows she is on the right track when actor George Rowton (Maurice Good) is poisoned moments later. She secures accommodation in the boarding house in which the cast are staying to further her investigation and Cosgood leaves a copy of his play Remember September in her bedroom to read. Narrowly avoiding an attempt to silence her (one which claims the life of another actress by mistake), Miss Marple unmasks the killer. Cosgood appeals to her to finance Remember September, but she says "Mr Cosgood, whatever else I am, I am definitely no angel." The theatre in which the Cosgood Players perform and where much of the action takes place was The Palace Theatre in Watford, Hertfordshire. At the time, it was being run by Jimmy Perry (creator of Dad's Army, It Ain't Half Hot Mum and Hi-de-Hi!) and his wife Gilda. The scene of the murder and associated village scenes were filmed in Sarratt, Hertfordshire. The name of the first film in the series, Murder She Said, is also the title of the Cosgood Players production that appears on the playbills in the murder victims suitcase. Marple performs a section of the poem The Shooting of Dan McGrew by Robert W. Service in the film. ↑ Hal Erickson. "Murder Most Foul (1964) - George Pollock - Synopsis, Characteristics, Moods, Themes and Related - AllMovie". AllMovie. ↑ "Murder Most Foul (1964)". BFI. 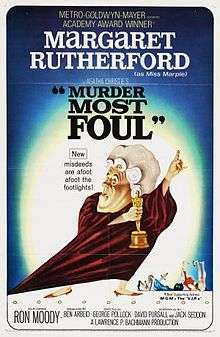 ↑ "Murder Most Foul (1965) - Articles - TCM.com". Turner Classic Movies. ↑ "Murder Most Foul (1965) - Music - TCM.com". Turner Classic Movies. ↑ "Murder She Said (1961) - Articles - TCM.com". Turner Classic Movies. ↑ "Robert W. Service (1874-1958) Poet & Adventurer: Miss Marple "Murder Most Foul"".